Citizens Advice Scotland is concerned that a digital by default approach to welfare benefits could exclude some of the most vulnerable and marginalised members of society from accessing the very services they rely upon. We published a brief report on the impact of this approach in February 2013 as part of our Voices from the Frontline series, focusing on case evidence from across Scotland. 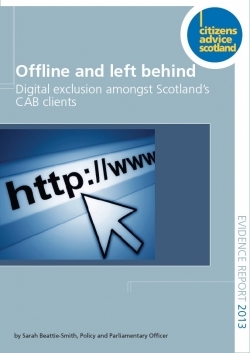 We have now undertaken research with CAB clients across Scotland in order to gather quantitative evidence about their internet access and capabilities. This report details the findings of that research. Only half (54%) of CAB clients have an internet connection at home. 36% of respondents said they never used the internet and a further 11% said they hardly ever used it. Just a quarter (24%) said they would be able to apply for a benefit on their own with no problems. A total of 76% of CAB clients said they would struggle to apply for a benefit online including 39% who said they could not apply online at all. Nearly three quarters (72%) of CAB clients said they would struggle to apply for a job online, with just 28% saying they could complete an online application on their own with no problems. Almost half (49%) of those CAB clients who said they would be completely unable to complete a benefits application online said that their main barrier was that they had never used a computer before. Another 16% said that their main barrier would be health related, including physical disability (5%) or mental health problems (4%).